On Tuesdays we are thrilled to fling open the doors to all of YOU! We love hearing your dreaming stories…the lessons you’ve learned, the roads you’ve walked, the dreams He’s planted in your hearts! Today we are thrilled to welcome Amy Dalke, a God-sized Dreamer who shares this awesome, out-of-her-comfort-zone story…we know she will inspire you! It’s not every day that a workaholic turns off the office lights, and leaves her career, comfort, and fashionable leather briefcase behind in the dark. Unless God decides to change up her story. That’s exactly what happened with me. Until February, 2014 I was a Managing Partner for a recruiting firm focused in economics and finance. (That alone is irony, given that I don’t know the first thing about a regression analysis. And finance-talk makes my head spin.) But whatever. When I was 21 years old, God planted a dream in my heart to speak and write. Yet the seed of that dream stayed underground for many years, as my career took off; marriage and parenthood happened; and other life details filled calendar after annual calendar. But then February, 2014 came around (16 years and lots of mess later), and God perfectly lined up all the circumstantial details that opened the door for me to leave my partnership position, to focus on that writing dream. This God-shaped, wide open door was practically outlined in neon green and flashing lights. Yet as I stood mere inches in front of the threshold, doubts flew at my face with a dizzying speed. What if I just can’t do it? But seriously, what if no one even likes my writing? Shaken by these unknowns, I turned to the right and saw a box overflowing with All The Things I would leave behind if I stepped into God’s footfalls. It was piled high with the security blanket of a healthy cash flow, and a great business; it was stacked with the comforts of boundary-less shopping, and the luxuries of travel on a whim. As I added all this up in my head…that Dream-Door God opened was eclipsed by my comfortable lifestyle. Fear screamed like sirens through my mind, because my identity was wrapped tightly around my cash flow; it was etched into the nameplate on my office door; and it was sewn into the fabric of my shopping excursions. I would have told you all day long that my true identity was in Christ. That he was the source of my worth, my everything, so to speak. Yet it rocked me to the core to put feet on those words. With eyes still stuck on My Stuff, I was reminded of Abraham. Abraham considered God’s promise to be more real than the things he could see, feel, or logically explain. He left comfort and financial security behind, knowing nothing about his destination. 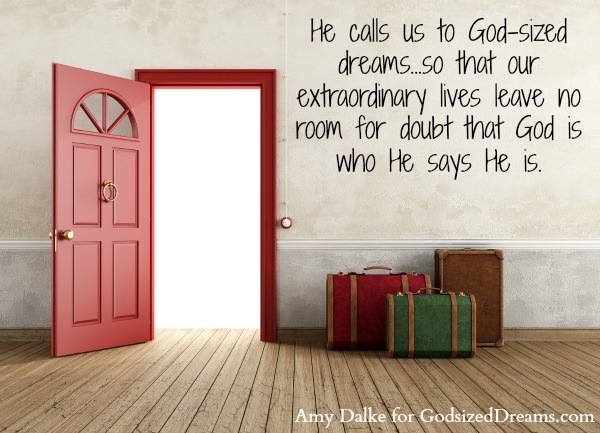 He calls us to God-sized dreams…so that our extraordinary lives leave no room for doubt that God is who He says He is. A life that doesn’t require faith has no space to hold God-sized dreams. Because it’s chock full of our comforts. We were made for more than comfort: we were made to show His awesomeness through our own impossibilities. In a move that uprooted all comfort and security, I forged ahead over that doorstep by the grace of God. It’s been nine months now. The budget is tighter. My shopping cart is lonely. And I’m totally far left of my comfort zone. But I’m smack dab in the middle of where God wants me. And comfort is totally overrated. 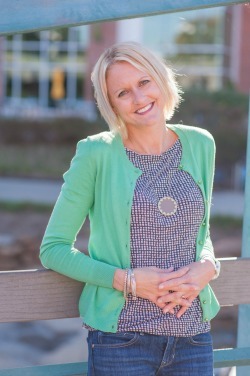 Amy Dalke’s favorite obsession is helping you discover how awesome you really are in Christ. She inspires you to step out of the world’s mold, and to live into the one-of-a-kind shape God designed just for you. Amy is a baseball mom, a Bible study teacher, and a wife who can’t cook. She has a tendency to be high strung (but is always working on that), and you see her every time you go to the coffee shop. (She’s the girl in line ahead of you with the obnoxious order.) 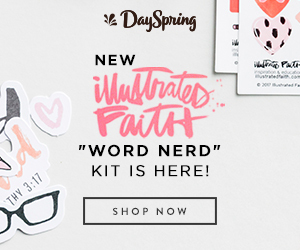 She’s slightly nerd-ish about the Bible, but it’s only because she’s a mess without it. And p.s. her favorite food is peanut butter and jelly. You can keep up with Amy on her blog or Twitter. Needed to hear this more than ever, as God is calling me to something that honestly, I don’t want, not in the way He’s presenting it anyway. A something I thought would look very different than what He’s doing with it. Thanks for the encouragement. Love this! I laughed out loud at, “Was God nuts? He should ask me to let go of my crockpot or something. (I never use it anyway! Seems like a far more reasonable option. )” Oh yes! I’ve had similar kinds of thoughts/whines. Good stuff. Thanks, Charlotte. I’m so glad someone identifies with me on that. Because seriously. I’m so awkward in the kitchen. Oh I do LOVE comfortable! I get all itchy when I feel God calling me out of my comfort zone. I play it safe way too often and miss out of good things because I want to know if the risk is going to work out and be worth it. Thank you for sharing your words with us today! I know I needed them! Alecia…yes. Itchy is definitely a great way to put it! I beg God all the time to make sure I don’t settle. Because I’m such a fool, with a big time tendency to crave my comfort. Thank God for grace, right?! Since I need to basically bathe in it. Thank you for sharing this. I think there are many moms, stuck in their careers, wanting out, but not really sure how or when to make the leap. I’m making mine soon, and I am utterly terrified as my salary is required – it’s not a nicety. And I would not be able to go back to work in my industry in the area that we live – I’d be burning bridges (even if I leave nicely) with the one employer in my field. It’s a scary thing, but I do think I see a neon light… I just haven’t quite gotten to that exit yet. Oh Amy, it’s so good to read your encouragement here. Thanks for sharing your story so honestly. Amy, you totally rocked my world with this post. Yes, for far too long my identity was wrapped in those same things. I brought a check home. I made a good salary. And oh yes, shopping. But my heart was empty. I love that you’re right where God wants you to be, and I’m praying you forward, girl. Much love to you. Abby!!! I think I’ve assumed you always stayed home. I am so glad for your comment- because it makes me want to hear your full story! I mean I totally already loved you in that preconceived image of you, but wow, I’m dying to hear more. This just made my day. Amy, as usual, my heart smiles when I read your words. I’ve not left the corporate world to enter the uncomfortable zone. But here I am, just the same. I really think God is trying to teach me to be comfortable with the uncomfortable. Not that He hasn’t poured out unending blessings. Oh my, what He has given me! Sometimes I think the greatest blessings come wrapped in discomfort. I’m still in a process (aren’t we all?) of taking life one day at a time and striving to be obedient in each step He asks me to take. All too often my focus is on “waiting” and “seeking His plan,” when the truth is I’m right in the middle of it. THIS is the God-sized dream of my life. I’m living it–right here, right now. Thanks so much for reminding me, Amy–“We were made for more than comfort: we were made to show His awesomeness through our own impossibilities.” YES! Blessings to you today, sweet friend! You are such an encouragement to me. I am SO glad that I read this. Such a great story, Amy. Thanks for sharing. I love this: “A life that doesn’t require faith has no space to hold God-sized dreams. Because it’s chock full of our comforts. 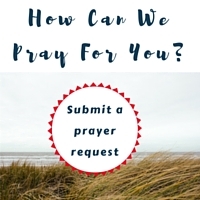 We were made for more than comfort: we were made to show His awesomeness through our own impossibilities.” My life (as a church planter in the Middle East, home schooling mom, and now writer) requires faith and leaving aside some comforts. And you know after 15 years here I still whine about it some days???? You’d think I’d learn, but I’m a bit slow. So thanks for your encouragement to leave our comforts and keep following our call. 🙂 Just like Abraham.